Yusef Williams Says Rihanna Is Not a "Diva"
There's nothing you can't expect from a Fenty Puma by Rihanna show. Last season, the celeb designer took her show to Paris, where we watched models strut down long library tables. For the collection before that, models like Bella and Gigi Hadid came strolling down the catwalk with painted, white hair. This season, before pink fog descended onto the audience of the Park Avenue Armory, before the motocross bikes jumped and flipped over gigantic mounds of millennial-pink sand, four hours before (to be exact), RiRi's mane guy and the show's lead hairstylist, Yusef Williams, was just starting his first look…on Kaia Gerber, no less. "She's so gorgeous," said Yusef of Cindy Crawford's daughter. "Oh my god, and she's like, ‘I'm so happy to do this show!' She's the sweetest and she looks exactly like her mom." Just minutes before that, Rihanna arrived to make sure her motocross-chic–inspired vision was coming to life. "Teamwork makes the dream work," Yusef calmly told E! News backstage before the runway show. "She's always involved. Even prior to today, we've been talking about hair and makeup for months…we work together. It's a team effort." The veteran hairstylist is used to on-the fly, high-pressure moments. He's responsible for many of Rihanna's most epic hair looks, after all—her high bun at the 2017 Met Gala, her tight, long waves at the Valerian premiere, her many wigs…the list goes on. But how do you create runway-worthy hair for a show the designer even admitted was a good challenge? It's all in the details. "We've done so much with Puma so far, and we just wanted to tap into those areas that we didn't really touch, even if it didn't make sense at first. We wanted to make sense of them, like the motocross, the surf or even the bungee cords from rock climbing or even surfing. 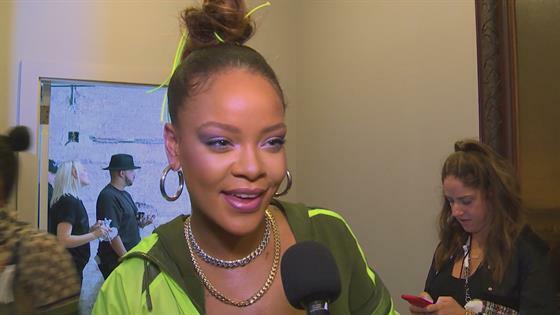 They don't really make sense when you say it out loud, but we had to find ways to use them as inspiration," Rihanna explained in an interview. 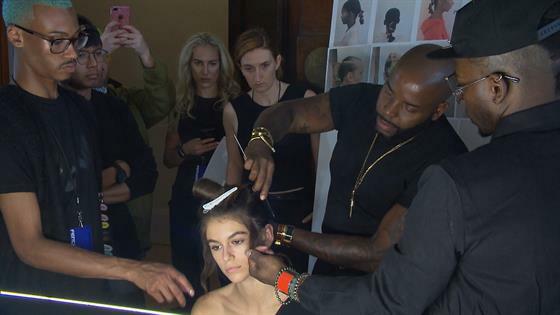 And so Yusef did, weaving bungee cords throughout edgy-yet-wearable ponytails. As we watched the pro section Kaia's hair into two parts, one on top of each other, then twisting strands, hair-spraying and securing the ponies together with neon cords, we could see the designer's influence and inspiration coming alive in the stylist's work and, at the same time, his precise execution contributing to hers. At the demo's end, Yusef took Kaia's tendrils and combed them into her hair using hairspray to finish a sleek, badass look that would later awe hundreds of people (along with everything else).